Tubes made of copper provide excellent thermal and electrical conductivity, as well as corrosion resistance, strength, ductility and a wide temperature resistance. These properties, in addition to their superior formability and light weight, make copper tubes the most popular choice for plumbing, heating and cooling systems in residential, commercial and industrial buildings. Copper tubes are easy to install, inexpensive to transport and have long life spans with low maintenance. Because they are compatible with a large range of liquids and are so resistant to a wide variety of environmental conditions, tubes made of copper provide a long term performance that is extremely cost effective over long periods of time. They form piping systems both above and below ground, in freezing temperatures as well as in high heat applications. Fire sprinkler systems, cryogenic plants, air conditioning and refrigeration systems, hospital oxygen systems, gas and steam heating systems and drain/vent systems all use copper tubes as pipes. They also take up less space than other metal pipes. In order to ensure safety and quality, all copper tubes must adhere to strict ASTM (American Society for Testing and Materials) standards concerning copper purity, design, fittings and liquid/gas compatibility. They are generally formed by the extrusion process, which fabricates seamless tubes with uniform wall thickness and a smooth surface. Solid-profile copper billets in the shape of rods are heated until malleable and then forced through a series of smaller and smaller molds in the shape of a tube until the desired shape has been reached. After extrusion, they are often bent using rollers or mandrels, and attached to each other at the ends by welding. Most copper tubes have threaded ends, one male and one female, so they can easily attach and detach from one another. The threading is non-permanent but still provides a reliable, air and water tight seal. Sometimes tubes are joined by brazing, a welding technique that uses nonferrous filler material. A benefit of copper tubes is their flammability and explosion resistance. If a fire does start within the tube, it will not travel farther into the pipe system. 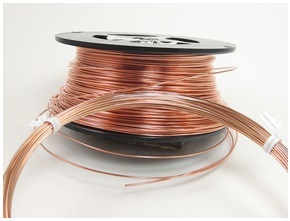 Copper tubes can have either soft or hard tempers, which is the metal’s overall hardness. This is accomplished by post-fabrication heat treatments. Copper Tubes Copper tubes are hollow metal piping systems that are used to convey both liquid and gases. They are always made of copper that is at the minimum 99.9% pure, meaning no alloys are used.